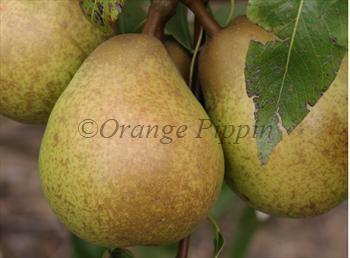 Josephine de Malines is a traditional winter pear, noted for its high quality flavour and excellent keeping qualities. Pick the pears as late as possible, and then keep them in a fridge or cold garage. Bring them indoors to ripen in a fruit bowl. Please fill in the details below and we will let you know when Josephine de Malines pear trees are back in stock. Developed in the USA, Josephine de Malines is one of its parents. Also raised in Malines in the early 19th century, a late-season pear with excellent flavour. Josephine de Malines is in flowering group 4. Josephine de Malines is self-sterile and needs to be pollinated by another tree of a different variety nearby. Josephine de Malines is a weak-growing variety, and therefore best grown on the more vigorous rootstocks and/or in rich soils. It is however an excellent cropper - and a good example of the apparent contradiction that weak-growing varieties can nevertheless crop heavily. The tree is hardy and reliable and will survive in most conditions. However for fruit production it is important to note that Josephine de Malines is a very late-ripening variety and therefore is best grown in areas where warm dry weather persists into late autumn. Raised in the 1830s by fruit enthusiast Major Esperen from Malines in northern Belgium. This city is today more usually known by its Flemish name Mechelen. The Major named his new variety after his wife Josephine. Major Esperen is also thought to have raised the green gage Reine Claude de Bavay, which is probably the most widely-planted of all green gages.